Australia's captain Michael Clarke believes his former deputy Shane Watson is facing stiff competition for his place in the side but remains part of the team's Test future. Watson will miss the upcoming series against Pakistan in the UAE due to a calf injury and his place in the Test side is likely to be occupied by Mitchell Marsh. It continues Watson's unfortunate run of injuries over the past few years, after he missed the entire 2011-12 home Test summer with calf and hamstring problems, and three Tests of the following season due to a calf injury. He played on the 2013 Test tour of India as a batsman only but failed to have any impact, and his future selection appears to hinge on his being able to bowl. At 33, he still has time ahead of him but if younger allrounders such as Marsh, or in spinning conditions, Glenn Maxwell, succeed, it will create tougher decisions for the selectors. 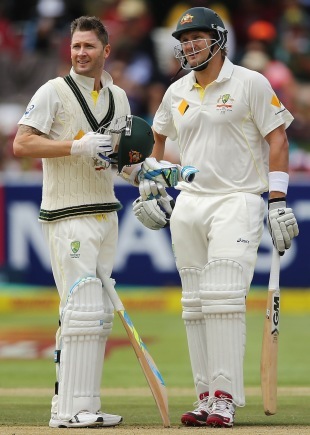 However, Clarke said Watson remained an important player for Australia in the next few years, provided his body allowed him to play at his best. "I think if Watto is batting and bowling, he's a huge part of our team, but he's obviously got some stiff competition now as well," Clarke told reporters at the New South Wales season launch on Wednesday. "Watto's greatest challenge has been trying to stay fit and healthy and I think we also need to understand and respect that he's pushed his body to the max being a batsman and bowler. "He bowls at a good pace and is a destructive batter so there's still going to be injuries for the rest of his career, as there is for Mitchell Marsh, James Faulkner and all the allrounders. If Watto can get himself fit and healthy he'll certainly play a lot more Tests, one-day and Twenty20 cricket for Australia." Fitness problems have played havoc with Watson's international career; he has played only 52 of a possible 106 Tests since his debut, the majority of those he has missed being due to injuries. By comparison, Clarke himself has missed only one Test due to injury, when his back prevented him from taking the field in Delhi in 2013, but he faces a challenge to prove his fitness for the Pakistan Tests. Clarke suffered a hamstring injury ahead of the recent one-day tri-series in Zimbabwe and aggravated the problem when he played his first match of the tournament, forcing him to fly home early. He will fly to the UAE on Tuesday, six days before the rest of the Test squad, to work with the team physio Alex Kountouris and give himself the best possible chance of recovering in time. "Alex knows my body very well," Clarke said. "He'll be the one that gives me the all-clear to play the Test matches if he thinks I'm fully fit. If I pass what Alex needs me to pass that will give me a lot of confidence as well." Watson captained Australia in Delhi when Clarke was ruled out, but Brad Haddin will become Australia's 45th Test captain if Clarke misses the first Test in Dubai, which begins on October 22.